We often think of 3D printing as a way to create specific components in our builds, everything from some hard-to-find little sprocket to a custom enclosure. More and more of the projects that grace the pages of Hackaday utilize at least a few 3D printed parts, even if the overall build itself is not something we’d necessarily consider a “printed” project. It’s the natural progression of a technology which at one time was expensive and complex becoming increasingly available to the maker and hacker. But occasionally we see 3D printing used not to create new devices, but recreate old ones. A perfect example is the almost entirely 3D printed telegraph system created by [Matt]. Projects like this help bring antiquated technology back to a modern audience, and can be an excellent educational tool. Showing someone a diagram of how the telegraph worked is one thing, but being able to run off a copy on your 3D printer and putting a working model in their hands is quite another. [Matt] acknowledges that he’s hardly the first person to 3D print a telegraph key, but says that he’d never seen the complete system done before. The key is perhaps the component most people are familiar with from film and old images, but alone it’s really nothing more than a momentary switch. To actually put it to use, you need a telegraph sounder on the receiving end to “play” the messages. The sounder is a somewhat more complex device than the key, and uses an electromagnet to pull down a lever and produce an audible clicking noise. 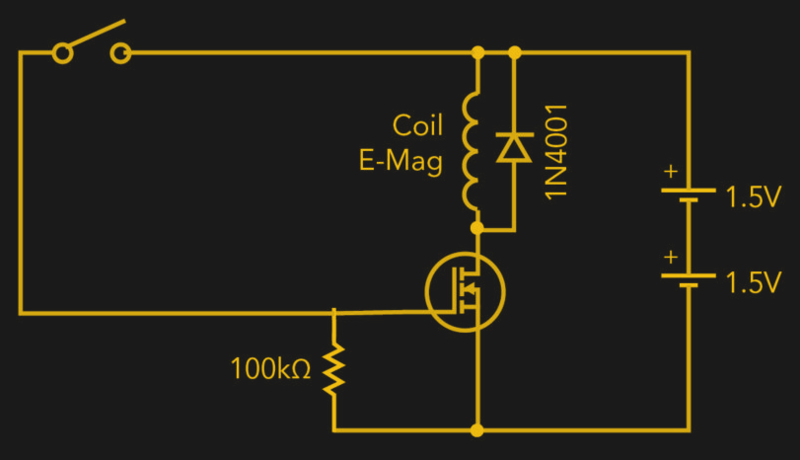 In the most basic case, the coil is directly connected to the key, but in a modern twist [Matt] has added a MOSFET into the circuit so the electromagnet is triggered locally within the sounder. This prevents sparks from eroding the contacts in the key, and alleviates problems associated with current loss over long wire runs. We’ve previously seen 3D printing used to revive vintage games which are no longer available such as “The Amazing Dr. Nim”, and how modern techniques such as additive manufacturing can help put World War II aircraft back in the air. While there was never much question that 3D printing would be a big part of our future, it would seem to be taking a fairly active role in preserving our past as well. Yep, all except the parts that actually make it a telegraph. Like nuts, bolts, and screws? What, are they supposed to print the wires too? Maybe the batteries? What’s even the point of this comment. Don’t get me wrong. The project is really great. No criticism intended whatsoever. But I’m kind of tired of hearing about how everything can be 3D printed. Even 3D printers themselves (yeah, rep-raps are almost completely ‘self-replicating’, except for the motors, motor controllers, bearings, hot ends etc etc etc…………….). It just isn’t true. 3D printers are great, but they are usually only capable of printing the housing for the actual functional parts. This is admittedly often the trickiest bit, but ‘almost entirely 3D printed’ is (in my very humble opinion) an overstatement. Well now that you have solved that problem, time to get back to operation “Get off my lawn”. Very polished looking, well done! As far as the circuit goes, it seems like it would be more in the spirit of a real telegraph system if the signal were transmitted as a current rather than a voltage. Based on the photo, it appears that the fet is in the sounder. Therefore the loop running through the key must be determining the gate voltage. Unfortunately, that would likely limit the useful distance of that wire loop; the longer the loop, the more easily EMI can enduce a voltage that will cause the fet to glitch. If the fet were instead inside the key, the wire loop between key and sounder would then instead be passing the current necessary to actuate the sounder. It would be immune to EMI and would work at a greater distance until the voltage drop of the wire prevents the sounder from actuating. Good point, actually. That would be a better solution for a much longer distance if I ever need it. I will need to experiment to see how long of a wire it would take to glitch. I did take some liberties such as using neodymium magnets instead of springs, for example. When I designed it was originally to just be a simple loop circuit with a switch. It does work in the basic loop circuit mode. The sparking at the telegraph key very quickly degraded its performance and since I only had 100+ feet of telephone wire that had about 6Ω of resistance I decided to put the MOSFET in the sounder since the batteries were already attached there. My goal was only operate it between different classrooms. You could use a snubber across the switch for minimizing the arcing. A small value electrolytic cap can be used as its parasitic has small R in series. It might be immune to man made EMI but not a near strike of lightning. I lost a SW radio due to a few feet of wire out the window, the strike was a mile away. FET front end gone.